In a suit filed today in California, Aston states that several elements of the Thunderbolt, from the grille to the badges to the side vents, are all protected under intellectual property law. "He's taken one of our cars and used our own design IP and claimed it has his own," Aston Martin's Simon Sproule told Jalopnik. "If anyone puts [those design elements] on a car in an unauthorized way, we have a right to defend it." Several uniquely Aston Martin styling components have been redesigned or exaggerated on the Thunderbolt, while other bits, like the front end, are incredibly close to other Astons – specifically the One-77 – and that's where the automaker is taking issue. 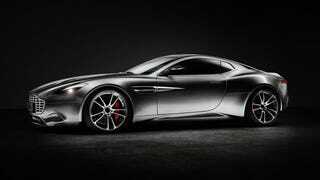 Aston claims that Fisker, who was Aston's former design director, reached out to the automaker about the design early on in the process, and Aston expressed concerns over the project. The automaker believed it would go in a different direction, and was surprised when the finished product debuted earlier this month at the Amelia Island Concours, prompting the suit. Fisker's false statements are intended to deceive consumers into mistakenly believing the Thunderbolt Prototype features the qualities and characteristics of the newer, higher- end Aston Martin VANQUISH model. Aston Martin has a long tradition of working with different coachbuilding companies in the past, primarily Zagato, which has partnered with the automaker as far back as the 60s and most recently in 2011. How Aston will prove that Fisker's creation is more than just an elaborate (and expensive) tuner car is up to the lawyers, but the design obviously hit a sore spot for Aston. "He's created a car, launched it in public, and that product has direct design elements copied from our car," says Sproule. "And it's protected under law."